English Gujarati Typing Converter helps to write Gujarati. Type the Gujarati text in English letters on the area below and press space key. It will convert to Gujarati. Don't copy and paste words. English Gujarati converter is a tool to write Gujarati using English letters. It helps to write Gujarati words using English keyboard in mobile or web browser. The characters are converted to corresponding Gujarati letters by its vocals. To get a Gujarati word just type the word using English characters and press space. It will automatically convert to the corresponding Gujarati word in the text area. Also, a suggestion list will appear to select the correct word if the default word given is not the target Gujarati word. To see Gujarati word a Gujarati font is installed on the system. If it is not installed then square boxes appear insted of Gujarati content. Then download and install a Gujarati font into the system for correct reading. 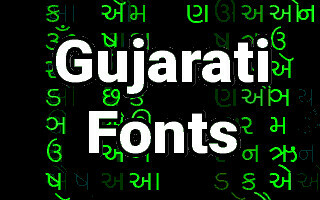 Gujarati fonts are free to download and use. Gujarati Fonts are freely avaiable on the internet and they are very easy to download and install into the system. Gujarati unicode fonts are released by various language development communitites. These fonts are avaiable on free license so there is no need to pay for the font. Gujarati unicode fonts are required to read Gujarati in webbrowsers like google chrome, firefox, edge etc.